“One book, one pen, and one teacher can change the world”. 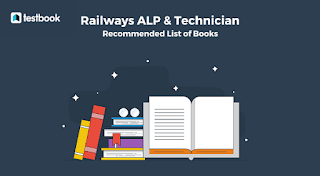 If you are just starting your preparation for Railways ALP 2018 Exam, you need to study from the right books to make the best use of your time. Here are some Best Books for ALP and Technician 2018 suggested by toppers strongly for effective preparation of Railways Assistant Loco Pilot (ALP) Exam 2018. These books will give you a head-start for your ALP exam preparation. If you are googling all over the Internet searching for the Recommended/Best books for the ALP and Technician Preparation 2018, then you have landed on the best page. As we all know that the RRB Study materials is a Savior for those candidates who are preparing for the recent railway recruitment Exams (ALP and Technician 2018). To crack this competitive examination you need to choose the best books and we have mentioned all the best books that you can have. Recently, the Railway Department has announced an opening for Assistant and Loco Pilot Posts. Over 26, 502 number of posts are available for both RRB ALP and Technician Posts. In this article, we have recommended the best books that you have for the ALP and Technician preparation 2018 suggested by toppers. Every year, the Railway Department announces notification for various posts like a clerk, station master commercial apprentice, English Assistant, Loco Pilot etc. To prepare better for the Exam, there are different types of books available in the market which can be very useful for the candidate. The candidates can also buy these books online. The RRB Assistant Loco Pilot books are published by various well-known publishers like Ramesh Publisher, Arihant Publisher, Kiran Prakashan, R.S Agarwal etc. The books are available in the pdf. Format also. The books will help the candidates to prepare for various competitive exams and keep them updated with latest facts and general knowledge that will help the candidates to grab good scores. The RRB ALP Books are available in both English as well in Hindi Language. It covers all the essential topics that are frequently asked in the Examination. Master Reasoning Book, Verbal, Non-Verbal and Analytical.